Home / Basketball Card Talk / Anybody Else Addicted To 2016-17 Donruss Optic Basketball Cards? Anybody Else Addicted To 2016-17 Donruss Optic Basketball Cards? 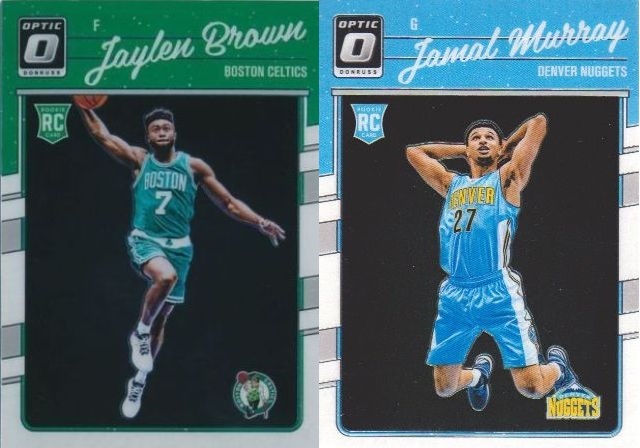 Are there anymore collectors out there that are addicted to the relatively new 2016-17 Donruss Optic basketball cards? Have you had your fill and now have moved on to the next new product? Not me! For some reason these cards have totally captured me and my wallet. I keep going to all the Walmarts and Targets in my area and grabbing blasters and retail hangers of this product. Please help me…I can’t stop! These cards are absolutely beautiful in my opinion. And I think I know why. It is because they remind me so much of Topps Chrome, which I miss tremendously. 2016-17 Donruss Optic basketball is produced in the design of 1990 Donruss baseball. How good will the rookie cards in this set turn out to be in the years to come? 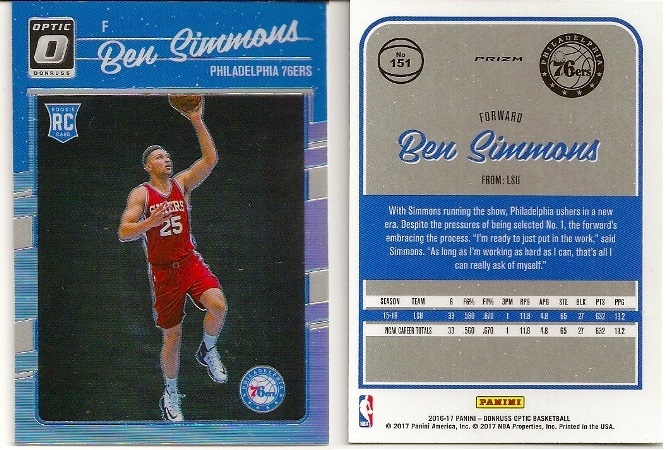 Of course time will tell, but for now this set is lead by the rookie card of Ben Simmons. I have been lucky enough to pull two of his rookie cards so far. I pulled the Ben Simmons 2016-17 Donruss Optic HOLO Silver Prizm refractor rookie card as well as the base version. I sold the Ben Simmons Holo Silver Prizm refractor, which you can see here. I also sold the base rookie here. As mentioned above, Ben Simmons is the top rookie to pull from 2016-17 Optic for now. It will be interesting to see in the years to come if this still holds true. The reason I say this is because I think back to 2009-10. Many collectors, including myself, were buying all of the 2009-10 basketball card products in hopes of finding the rookie cards of Blake Griffin, Tyreke Evans, Brandon Jennings and Johnny Flynn. In those same 2009-10 basketball card sets, there was a relatively unknown player out of Davidson named Stephen Curry. Now we fast-forward to 2017 and Stephen Curry is the king of all those 2009-10 basketball card sets with James Harden coming in at a close second. The same holds true for 2008-09 sets as well. Back in 2008, Derrick Rose was THE card to have, but now it is Russell Westbrook that is leading the way. Now back to this new 2016-17 Donruss Optic product. Although Ben Simmons was the #1 pick of the 2016 NBA Draft, he never played a minute of his rookie year because he got injured in the preseason and missed the entire year. When the 2017-18 NBA season rolls around, and if Simmons is healthy and ready to go, his Optic rookie card could catch fire. And if he gets off to a great start, the prices may sky-rocket. After Simmons, there are a few more rookie cards in the 2016-17 Donruss Optic basketball set that we should keep an eye on. Jaylen Brown of the Boston Celtics, Jamal Murray of the Denver Nuggets, Malachi Richardson of the Sacramento Kings, Thon Maker of the Milwaukee Bucks, Brandon Ingram of the Los Angeles Lakers, Kris Dunn of the Minnesota Timberwolves and Buddy Hield of the Sacramento Kings. 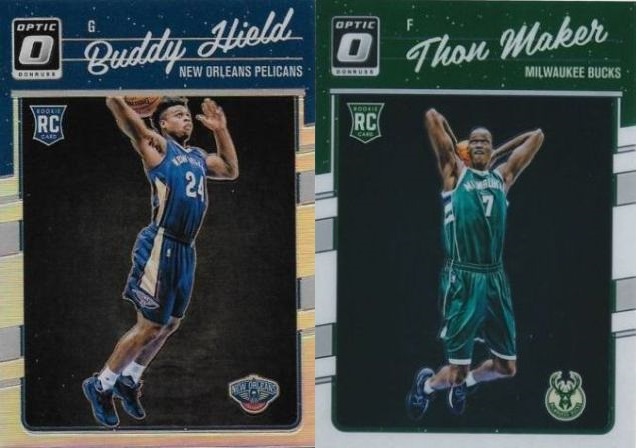 Buddy Hield’s rookie card shows him in his New Orleans Pelicans uniform. He was part of the trade that sent him to Sacramento in exchange for DeMarcus Cousins. In conclusion, I give the 2016-17 Donruss Optic basketball set an A+! Of course, this is just one man’s opinion. Previous post: Boston Celtics Get The #1 Pick Of The 2017 NBA Draft. Are You Kidding Me?